The Republic of Armenia is a landlocked highland nation in the South Caucusus region, between the Caspian and Black Seas. It was the smallest of the former Soviet Republics, bordering Turkey, Iran, Georgia and Azerbaijan. Mount Ararat, the biblical site of Noah’s Ark, is revered by Armenians as the home of the Gods and celebrated on their coat of arms, although it now lies across the border in eastern Turkey. Its snow capped peak, rising over 5,100 metres, is still visible from Yereven, the capital city. Yerevan was founded in 782 BCm according to a stone inscription, making it the oldest precisely dated documented city. In 301AD, Armenia became the first nation to adopt Christianity as a state religion. 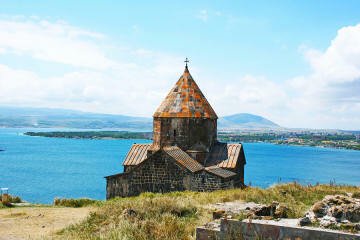 Lake Sevan is a beautiful mountain lake which covers 5% of the country. It is lined with pristine white beaches and ancient monasteries. The Armenian alphabet, invented in 405 AD by a man named Mashtots, comprises 38 characters. It was so well designed that it remains virtually unchanged today. The Manuscript Museum in Yereven houses 14,000 ancient documents in Armenian. Due to tragedies such as a forced resettlement after 1915 and the break up of the USSR, up to 8 million Armenians are thought to live abroad in communities ranging from the US to Russia. Only 3 million citizens remain in Armenia.